Once Nassau County Republicans were known to hold supermajorities in the County Legislature, a 3-2 voter registration advantage, the county’s state Legislature delegation, and the position of county executive far more often than not. Today the entire state Senate delegation for Nassau County is blue. Laura Curran, a Baldwin Democrat, is the county executive and former Long Beach City Manager Jack Schnirman is the county comptroller. And while Democrats do not control the County Legislature, they outnumber Republicans at the ballot box. Over the last 20 years, the Republican Party’s voter registration in Nassau County has steadily declined from nearly 380,000 voters in 1998 to 331,431 in 2018 – a 12.67 percent decrease – according to the New York state Board of Elections. In the same period, Democrats have been ascendant. In 1998 there were 273,733 registered Democrats. That number has ballooned 46.56 percent to 401,196 as of Nov. 1 this year, voter registration statistics show. Lawrence Levy, dean of the National Center for Suburban Studies at Hofstra University, said the changes can be explained by two things: the damaged brand of the Republican Party and a surge of immigrants to Long Island replacing older voters. “The numbers are very stark and if the Republicans are to have any chance of mounting a comeback, they’ll need a whole new suburban strategy that is much more moderate and focused on not just cutting taxes and services, but responding to the needs of people,” Levy said. 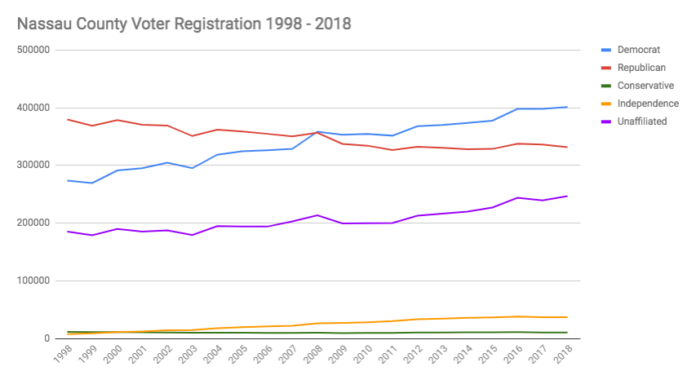 Independent voter registration – labeled “blank” in voter registration data – rose by a third in the last 20 years, from 185,221 in 1998 to 246,864 in 2018. Independents make up almost a quarter of voters, up from 21.3 percent in 1998. “We have to show our records and intentions and initiatives and appeal to the independent voters,” Cairo said. 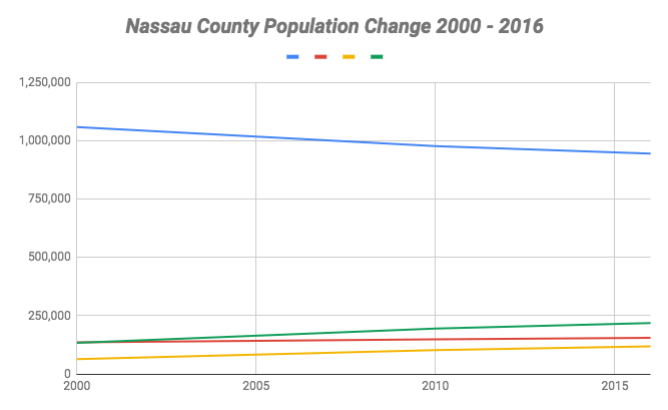 According to census data, Nassau County’s population identifying solely as white was about 1.06 million, or 79.2 percent, in 2000. By 2010 it slid to 977,577 people, or 73 percent of the population. According to American Community Survey data, whites made up 69.7 percent of the population, or 945,893 people, in 2016. In the same period, Levy said, minorities – known to lean toward the Democratic Party – have migrated to Long Island in search of opportunities. There were 133,791 people identifying as Hispanic or Latino in the year 2000; 10 years later, that number was over 195,000. As of 2016, according to the American Community Survey, there were more than 218,000 and they made up 16.1 percent of the county’s population. There were 63,614 people identifying solely as Asian in Nassau County in 2000, according to the census, making up 4.75 percent of the county’s population. As of 2016, the American Community Survey estimates there were 118,271 residing in Nassau County – making up 8.7 percent of the population. The rate of growth for people identifying solely as black or African-American has been a bit slower. 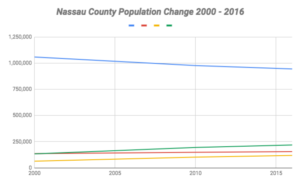 There were 135,764 African-Americans in Nassau County, the 2000 census found, and 155,583 in 2016 – raising their share of the population from 10.15 percent to 11.5 percent. Two and four-tenths percent of people in the 2010 census identified with two or more races. “This is a once or twice a century phenomenon that is related to economic and geopolitical influences that don’t come along very often,” Levy said of the shift. Asked if local corruption – such as the indictment Nassau County Executive Edward Mangano on federal corruption charges or the conviction of former state Senate Majority Leader Dean Skelos – played a role in recent wins, Levy pointed to the demographic changes.